"You should always be trying to write a poem you are unable to write, a poem you lack the technique, the language, the courage to achieve. Otherwise you're merely imitating yourself, going nowhere, because that's always easiest." In conjunction with our unit on literature, we study the ballad form of poetry. If class time allows, we create montages to illustrate diverse ballads and, individually or with classmates (the choice is yours), we compose original ballads based on news events, social concerns, myths, and legends. Ballads have existed for centuries, initially were not written down, but were passed down orally from one generation to the next. Many scholars point to the European folk tradition of the Middle Ages as the origin of the ballad. Others maintain that the genre is much older, dating as far back as the fifth millenium BCE, with roots in Eastern Europe and parts of the Orient. The term "ballad" comes from the French word "ballade," a French verse form consisting of three eight-line stanzas with the same rhyming pattern and a four-line envoi (refrain). In general we can define a ballad as a narrative poem with a straightforward, dramatic action, often meant to be sung. The language is simple to understand and sometimes written in the dialect of the region from which the ballad originates (see the first example below). Their themes are closely tied to those of the storytelling tradition. They typically concern hardship and suffering, tragedy, love, romance, murder, religious concerns and social injustices. While many ballads focus on tragedy, comic ballads do exist. Ballads usually begin with little or no explanation of context or characters. The stanzas, varying in number and sometimes numerous, can move from one incident to another with little or no commentary. They often contain dialogue, the repetition of key elements, and refrains at regular intervals. The audience is complicit in the story of the ballad. Instead of overtly stating any moral lesson to be learned, the ballad leaves it open to the listener-reader. 2. Who is the intended audience of the ballad? 4. Is there a dialogue between the characters, or is the story told by a first person or third person objective voice only? 5. What are the main points of the storyline? 6. How many stanzas are there? 8. Is there a refrain? If so, what is it? 9. Identify examples of alliteration, if there are any used in the ballad. 11. What images does the story evoke? 12. What is the theme of the ballad? 13. What visual images would you use to illustrate the theme of this ballad-poem? Why? 14. What kind of musical illustration would you use? Why? 15. Why does this ballad appeal to you? What about it, if anything, calls you to attentiveness? Question to consider: What about this ballad continues to attract artists to perform it over the decades? and here by Bob Dylan. The crazy old Vinegar Man is dead! He never had missed a day before! Somebody went to his tumble-down shed by the Haunted House and forced the door. with the same old frown on his sour old face. Vinegar - Vinegar - Vinegar Man! Face - us - and - chase - us - and - catch - if -you - can! Pepper for a tongue! Pickle for a nose! Stick a pin in him and vinegar flows! Glare -at-us- swear -at-us- catch - if - you-can! Ketchup - and - chow - chow - and -Vinegar -Man! a queer, quaint Valentine torn in two? "With dearest love, from Ellen to Ned!" Steal - us - and - peel - us - and - drown - us -in - brine! He pickles his heart in a valentine! Vinegar for blood! Pepper for his tongue! Glare -at-us- swear -at-us- catch - if - you - can! "With dearest love" to the Vinegar Man! And a queer, quaint valentine torn across . . .
torn, but it never was thrown away! "With dearest love from Ellen to Ned"
"Old Pepper Tongue! Pickles his heart in brine!" he died when he tore his valentine. Read the literary ballad, with illustrations by Gustav Doré, here. and to Richard Burton, Robert Hardy, and John Neville here. 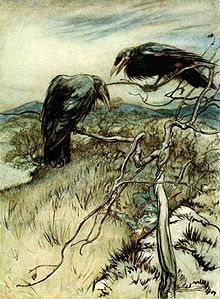 Arthur Rackham's illustration of the ballad "The Twa Corbies"
PBS NEWSHOUR: "Why are so many lullabies also murder ballads?" "The Song of Cesar Chavez"
"Corrido de la muerte de Emiliano Zapata"
"Ballads born of conflict still thrive in Columbia"